Think you can out-fox a fox? I have been waiting to get a photo of one of these critters! While it's not really a great quality photo, I'm still absolutely thrilled to have snapped this shot. Yesterday, Hubs and I went over to my in-laws' so I could pick up their van, which they are generously letting me borrow until my vehicle is fixed and once again has windows in it. On the way back, Hubs was following me, and this critter crossed the road in front of me. I quickly realized that the only other vehicle around belonged to Hubs, and, let's face it, he knows how I am. So, I didn't hesitate to stop and snap a couple shots. WooHoo - I've really been wanting a photo of a fox! Now that I've got one, I'm setting my goals on a better photo of a fox (hehe) or perhaps a shot of the mom and babies I saw a few weeks ago. Now, after I give you a link for fat burner supplements, I highly suggest you come and join in on the fun of Camera-Critters! what a cute fox, looks like he's shy. happy weekend. I didn't think you'd be able to post, Mist - you deserve a medal for your resilience, after all that's happened. Hmm, I must have missed something; what has happened? It would be nice if we could post our names on the list for camera critters much earlier in the morning on Saturdays. Is that possible?? Hope things are slowly returning to normal and that you're feeling a lot better after the other day !! I'm with David - I take my hat off to you for posting - and hosting! - this meme. Thank you. And great shot. Good for you, Misty, you got your fox!! You won! Looks much like our jackals in Israel. I love it. Well done. We've had a couple of foxes dash through our yard over the years and I wish I could've captured them on film. Good you were quicker than the fox. Having tried to capture foxes with my camera, I know how frustrating it can be. BUT YAY! You finally got one! 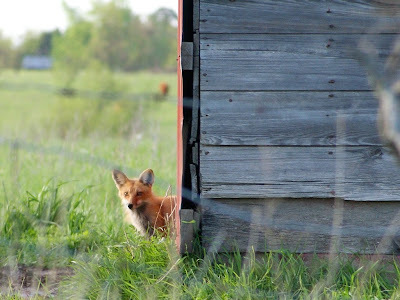 Misty, I think this is a great shot of the fox peeking around the corner. My daughter and I photographed a fox on a couple different occasions, but never did get a very clear shot. I resorted to shooting from inside the house, but, of course, the screen made for less-than-great pics. I think you did fantastic! Oh, how delightful! My friend at Little Bang Theory has a post of some awesome pics of fox pups. He's on my sidebar, if you want to check them out. They're really something special. Have a great weekend, Misty! Oh, ;) you foxy lady! Great shot! I wish we had foxes around here. Good for you, Misty! You got your fox and he's a cutie! It's a definitely a Foxy shot, Misty. I hope to see a shot of momma and the kits. Misty, that's a great capture. He looks surprised! Hope you get your dream fox shot. How cool! I love this fox capture. Really amazing. Well done, Misty. I seldom get to photograph a fox, even with the time I spend outdoors and I have no exceptional photos of them. Great picture! I love foxes. Such beautiful animals. I like fox really. But I know they are not like dog wherein you can just bring home and take care. I like this photo. hope all is well with you. thanks for sharing your photo! maybe the cuteness of this fox makes you feel better, after all these events in your life! my prayers are with you! What do you mean: 'not really a great quality photo'? I think it's wonderful. Very atmospheric. Great colours. I truly do like it very much. Did you have an accident with your car? What's happened? Are you okay? Aww...very cute, i love Fox's. Foxes are amazing creatures! They are beautiful and the subject of a lot of fairytales. Thank you for showing him! I prefer him to the snake which my daughter found in her bedroom! What a cute shot Misty! P.S. Johnny is taking us out to supper so I won't be back online till later. Love ya! Foxy looks a little sheepish as if caught doing something he shouldn't. Great photo - very difficult to capture these creatures. Congratulations! They are sneaky little devils. By the time you notice them, they are usually gone. I love this picture becuase is epitomizes what the fox is all about. Great shot!